With the weather changing outside, it can only mean one thing: another season of the One Room Challenge has come to a close. 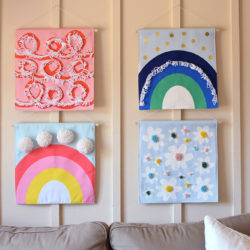 The six-week DIY home dec challenge encourages interior designers, bloggers and style lovers to put their design skills to the test. 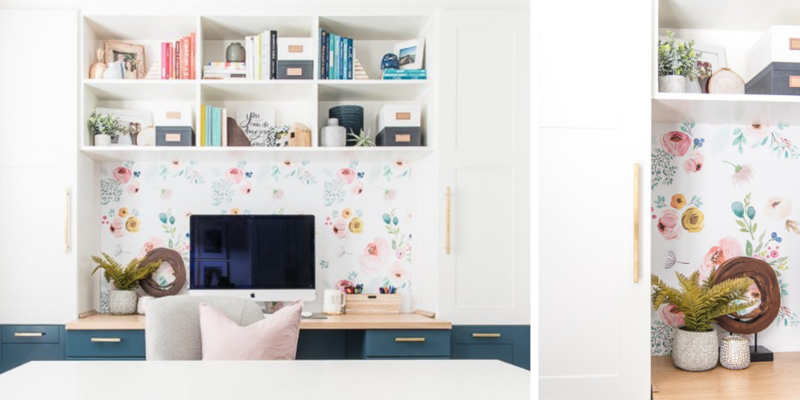 If you’re planning on revamping your home after the holidays, these rooms featuring Spoonflower and Roostery will give you a head start! 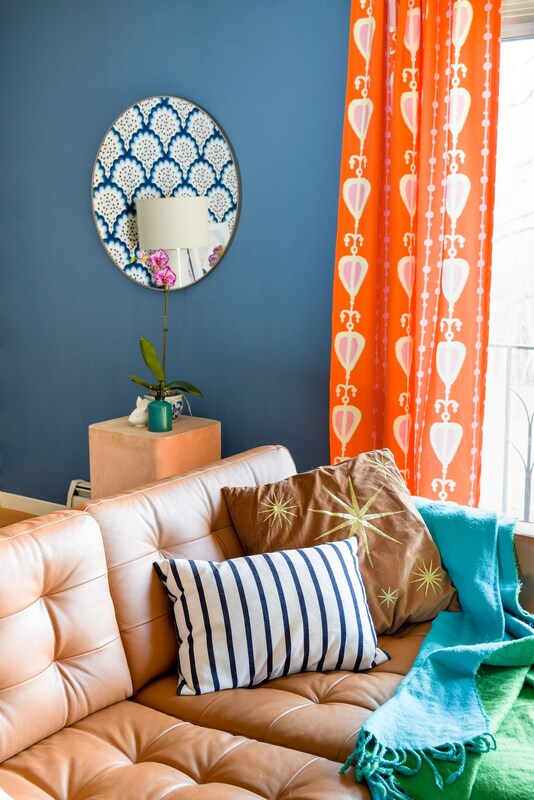 The colorful master bedroom reveal for Ashley’s One Room Challenge makeover will brighten your day. 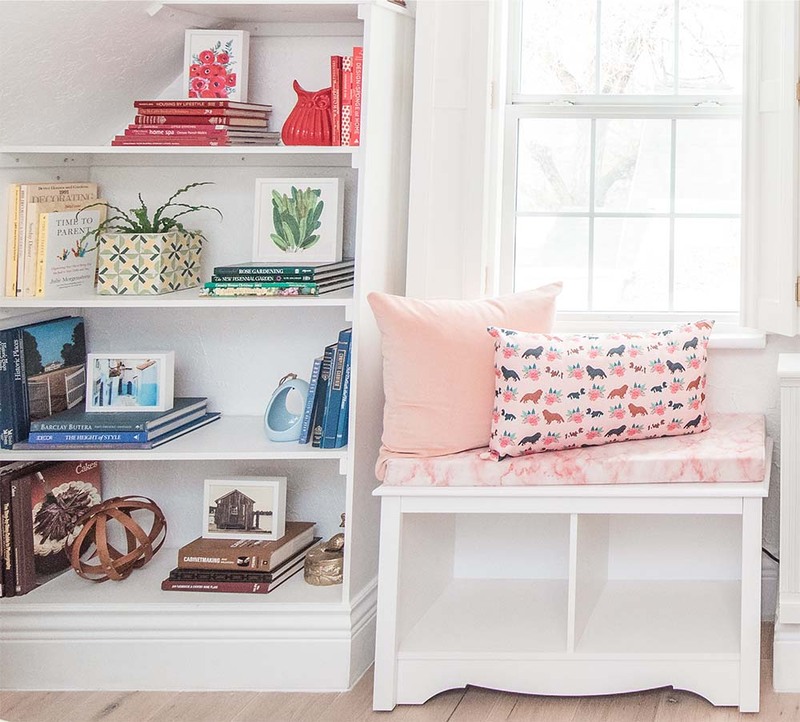 Her rainbow inspired bookshelf takes color-coordination to a whole new level and we love how she tastefully added a pop of pup with a PetFriendly lumbar pillow. The before and after of Candis’ One Room Challenge is a jaw dropper. 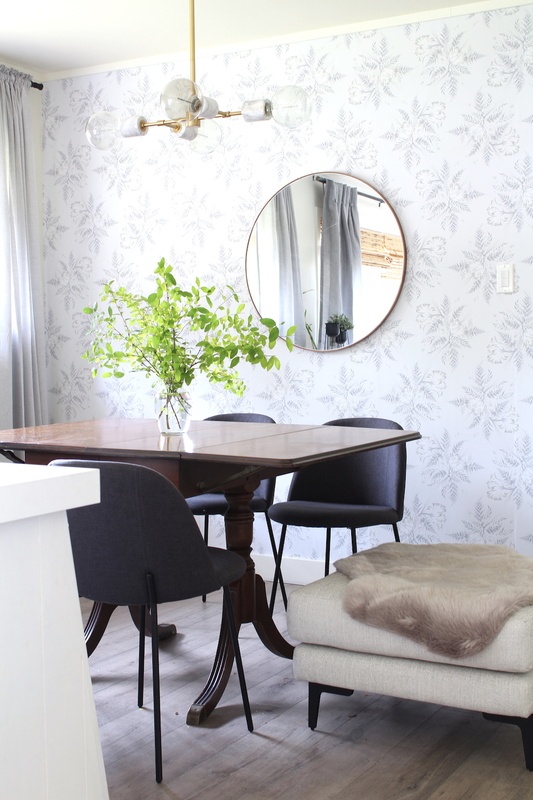 The modern approach to a victorian inspired room is fit for a queen – or in this case, Candis’ youngest daughter Kit! 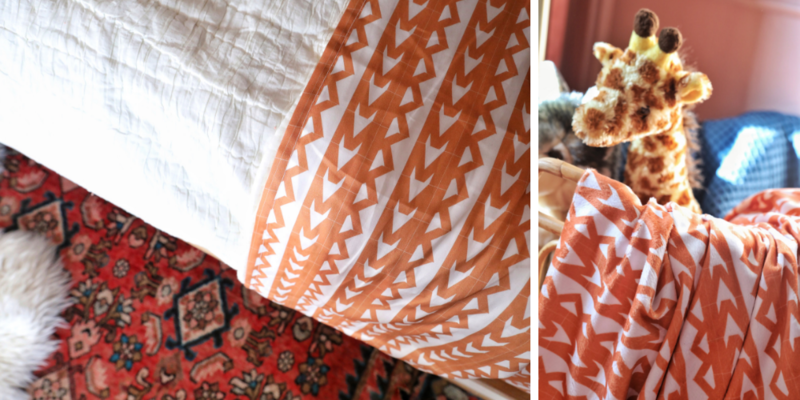 If you take a closer look at the custom Roostery sheets and Minky blanket, you’ll notice the repeating design is actually Kit’s initials, KM. Just by uploading one repeat of the letters, Candis created a one-of-a-kind touch for the bedroom makeover. To recreate these custom sheets with your initials, upload a JPG or PNG of your letters (just one repeat!) or create the design on the swatch template in the free design program, PicMonkey. Get started here. 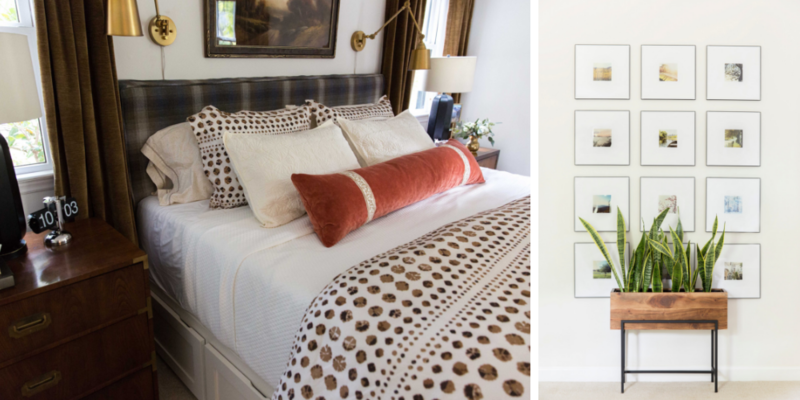 It can sometimes be tricky to find a balance between two different design aesthetics when you’re styling a bedroom with your partner. 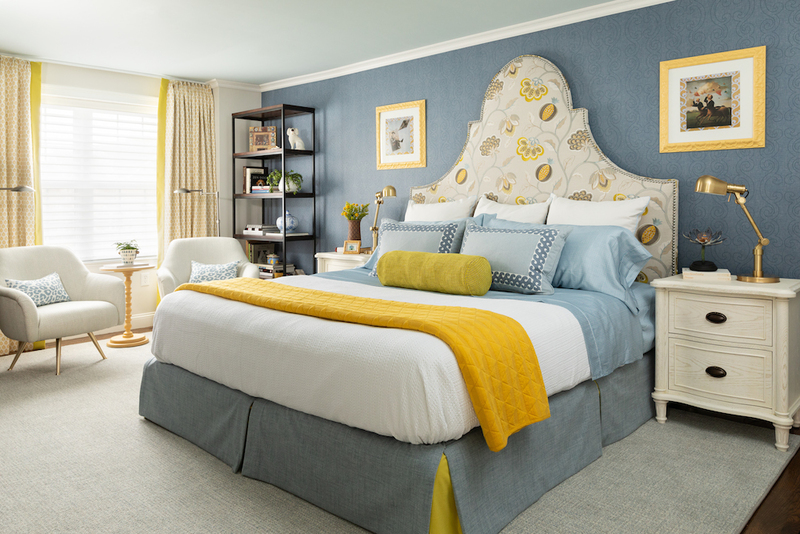 After seeing how Cate Holcombe redecorated her master bedroom, we began to have faith that it could be done! The brown shibori bedding and shams tie together the masculine and elegant room. 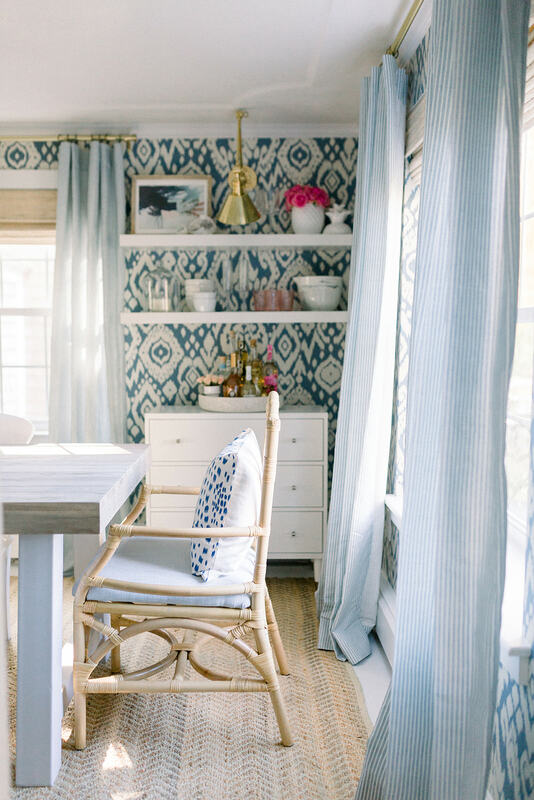 In just six weeks, Erin turned her tired, mismatched dining room into the New England cottage escape of our dreams. 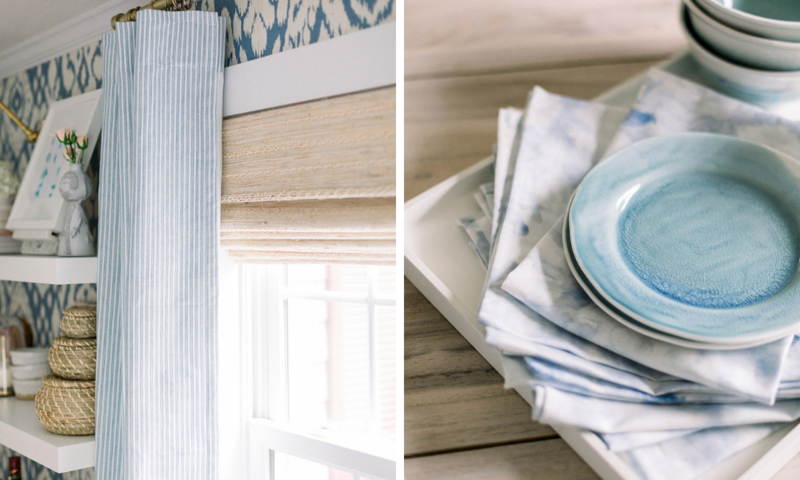 The touches of ikat, stripes and indigo textiles, plus accents of brass hardware, we’re anxiously awaiting our dinner party invite! What do you get when mid-century style meets modern farmhouse? Andrea’s One Room Challenge reveal! 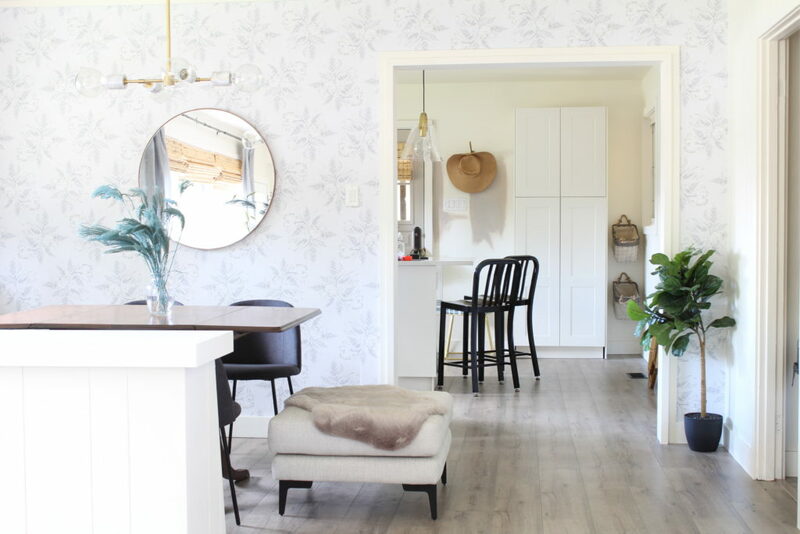 If you saw the before photos, you know this kitchen went from “Oh, no” to “Oh, yes!” The large-scale wallpaper design, Parrot Tulips & Ferns, adds a delicate statement in the room. You know that feeling when you walk into an elegantly decorated boutique hotel suite and you just wish your bedroom looked as perfectly styled as this room? 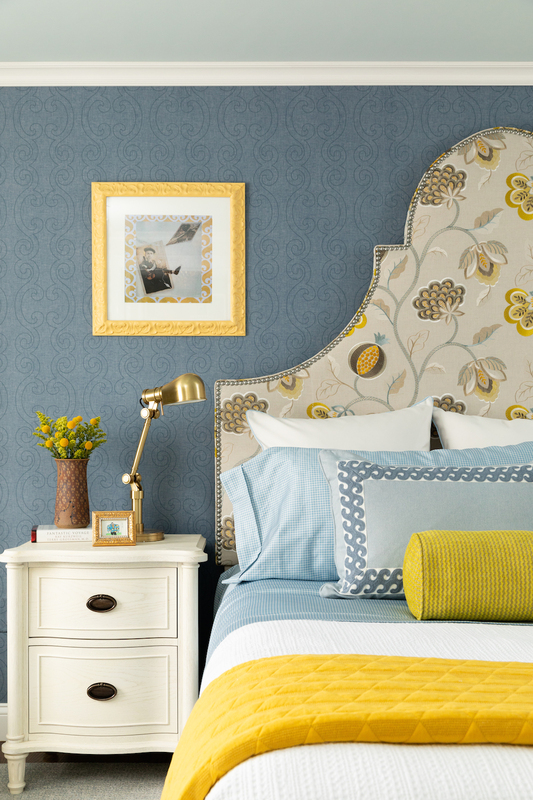 Linda Holt captured this exact feeling in her master suite makeover. Inspired by the Fermdale hotels designed by Kit Kemp, Linda played with pattern through florals, stripes and fresh shades of yellow and blue. 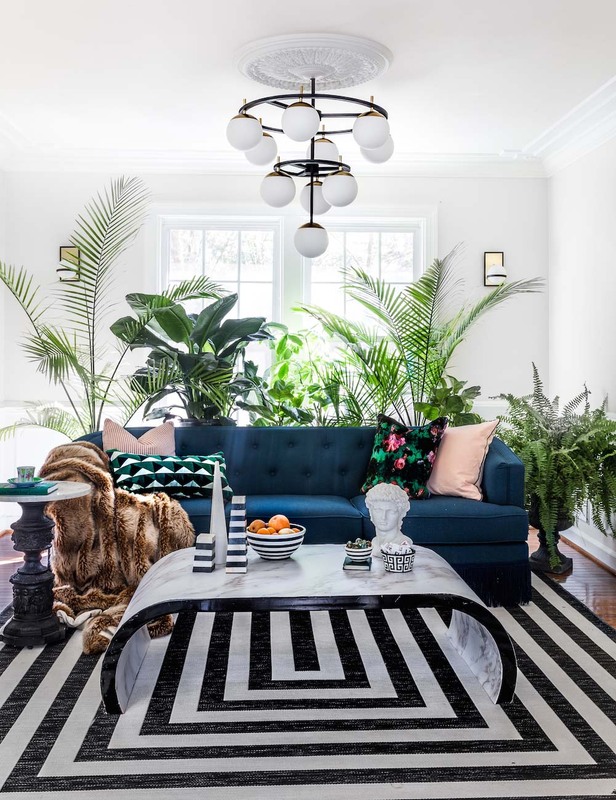 You may recognize Jewel from the Spring 2018 One Room Challenge when she took our velvet to a new level with a terrazzo Celosia Velvet™ couch. 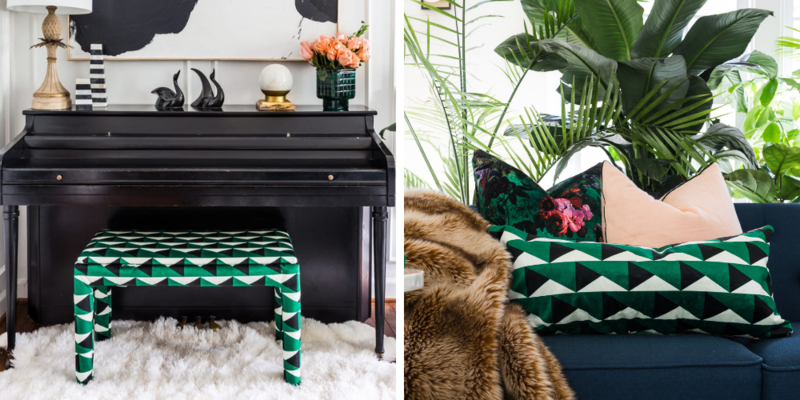 This time around, Jewel is working her velvet upholstery magic on a piano bench. 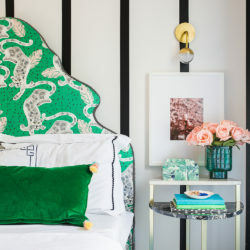 The large scale emerald triangles are channeling Jewel’s glam french bohemian living room vibes. 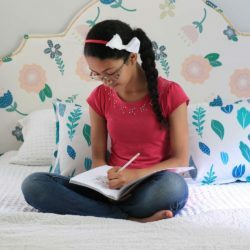 If you’ve been following the Spoonflower blog, by now you’ve gotten to know Ariel of PMQ for Two and her no-fear approach to bringing color and pattern into the home. Ariel’s ORC reveal was no exception. 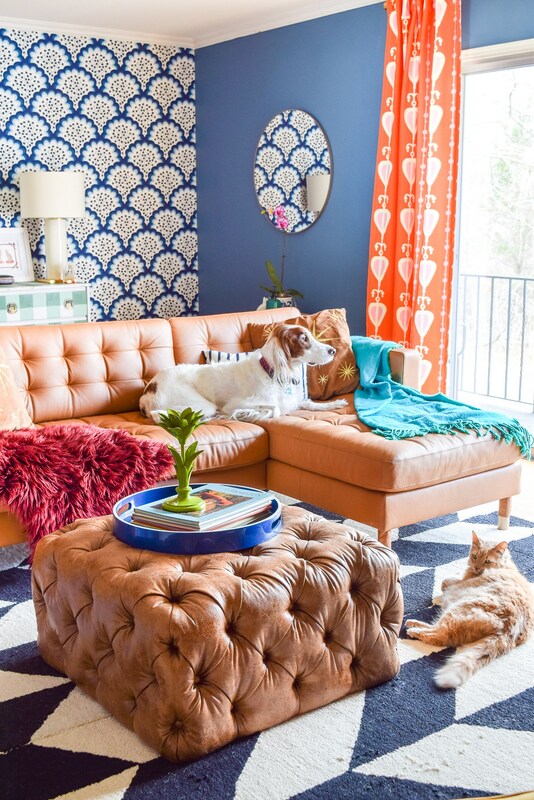 Her mid-mod living room mixes and matches eclectic patterns like Sweet Heart Stripe that pack a punch! 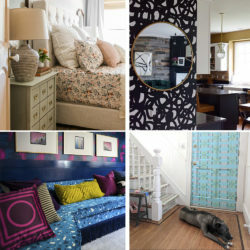 If there’s one thing we’ve learned over the years, it’s to never underestimate the power of wallpaper! 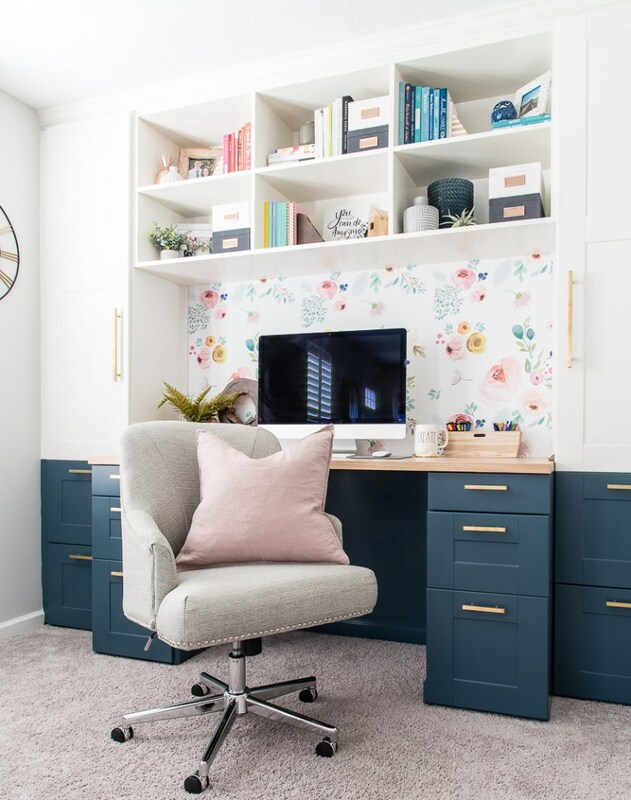 Using just a few custom rolls of peel-and-stick floral wallpaper, Christene’s home office makeover is what DIY dreams are made of. 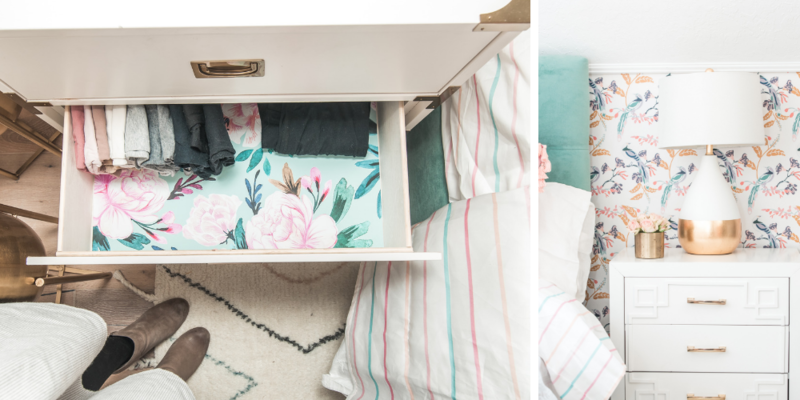 We can’t help but notice that she coined this portion of the makeover, “the easiest project of the whole ORC process.” Now, if only we could keep our space as organized as Christene! Thanks so much for sharing!! I love my office space and the wallpaper totally “made” the space.